It is the end of the year and it’s time to look back. 2013 was a good year for Orlando Interplex Destination Services and we are proud of it. We released this innovated website and kept working on improving the company’s web presence. We aim to cover the full process of planning a trip and the new website is a proof of that. We hope we made your experience as easy and intuitive as possible. A lot happened not only for our company but for the city of Orlando and its transportation options: The Orlando airport authority has approved an expansion of Orlando International Airport (MCO) so that it can accommodate 45 million passengers a year. The $1.1 billion plan will allow the airport to grow its capacity almost twice beyond its original design. Airport officials say they are confident a growing number of passengers are on the way because the economy is improving and theme parks are constantly upgrading, including Walt Disney World’s planned “Avatar” land at Animal Kingdom, set to open in 2017. “We hope to grow with our region and attract business,” OIA Chairman Frank Kruppenbacher said. The airport also set a new record. Orlando International Airport ends 2012 – 2013 fiscal year with a record number of international travelers. International traffic increased to 3.9 million travelers, 5.2 percent more than last year. At the same time domestic traffic is down by 2 percent to 23.4 million passengers. Surprisingly Allegient was confirmed to have the most destinations from Orlando. 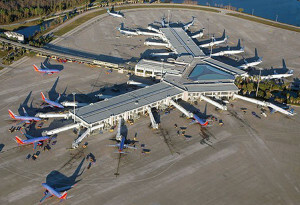 They beat MCO’s largest carrier Southwest, offering 52 different destinations from Sanford International Airport (SFB). They offer a great variety but to small town airports Little Rock, Ark. and Tulsa, Okla. Allegiant and Southwest both added new air services for Orlando this year and so did Spirit and JetBlue Airlines. There are more and more way to get to Orlando but InterPlex Destination Services stays the best choice for ground transportation. We wish you happy holidays and a great new year. We will keep providing you with professional service in 2014.